Below is an incomplete list of « rescue » videos showing « kids being rescued » from « rubble » after « Syrian/Russian bombing » prepared by the U.S./UK financed Syria Civil Defence aka the « White Helmets ». The group was created with the help of Purpose Inc, a U.S. company specialized in regime change NGO operations. Purpose Inc is also behind Avaaz which early on peddled fake war on Syria video propaganda. 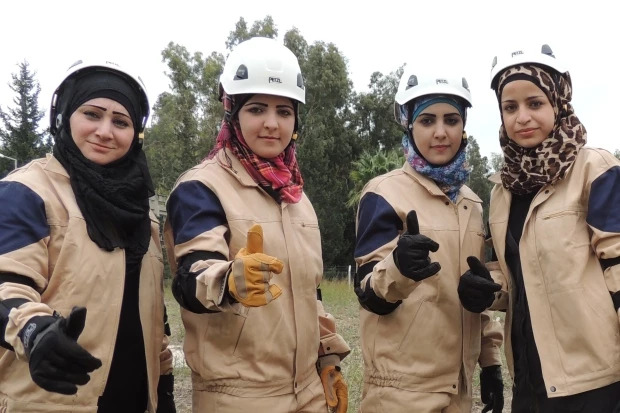 The White Helmets are financed, like all « Free Syrian Army » media propaganda, by USAID with some $23 million and by the UK Foreign Office with a total of some £23 million. The Netherlands and Japan also donated money to the scheme. The group was build up and trained since mid 2013 by a « former » UK military intelligence operator residing in Abu Dhabi. These are propaganda artists camouflaged as humanitarians. The « White Helmets » cooperate closely with al-Qaeda. One of its leaders was recently deniedan entry visa to the United States. More details about the group researched by Vanessa Beeley can be found here and here. Back to the « rescue » videos. That shtick started in late 2013. Independent – January 25 2014: Astonishing video shows moment Syrian toddler pulled alive from rubble after Aleppo bombing This video, like others below, was also published by the New York Daily News, The Guardian, USA Today, Yahoo and many other news outlets. After that great marketing success the movie script was serialized. Since then a new version of a « child rescued » video appears every other month or so. Here are just a few of these with all of them following the same script. USA Today – January 7 2015: Volunteers rescue children from rubble in Syria The video includes an interview with James Le Mesurier, a British “security” specialist and « former » British military intelligence officer who heads the White Helmets operation. Other typical features of these movies, see this one, are smoke (grenades) in the streets, dramatic but small open fires nearby, dust or some red color on the children’s face or arms. The camera is often used in a hectic, intentionally amateurish first person view, a style extensively developed in the 1999 horror clip Blair Witch Project. Sometimes sounds of additional « bomb impact » bangs or screaming/wailing women are added. All the above videos are just as (un-)real as the faked « Hero Boy » video showing a « Syrian boy ducking sniper fire to rescue a trapped girl ». Fake « opposition » videos have been a majorfeature of the media war on Syria. These fakes are often easily recognizable as such. We can be sure that the media professionals at the BBC and other outlets know that these are not real rescue scenes. They distribute them nonetheless.